The third century B.C.E. text known as the Zhuangzi , is a fun read. It is considered one to the three founding texts of Daoism, along with the Laozi and the Leizi. While it is central enough to be put on a Daoist altar, the aspects of it which are important to religious Daoism were later included in the Huainanzi, so as a text it does not actually play an important role in ritual. It has however played a very important role in Chinese culture. I like to think of it as a retirement gift to people who have spent their lives caring for others and serving the state. It's central message, if it has one, is trust. Trust the way things are going, ride the wave and be at play with life's ups and downs, curves and straights. The Zhuangzi is a collection of very readable prose. It is a funny book, funnier by far than any other book of comparable age. Historically the Zhuangzi itself has been part of a game in which people memorize the book, internalize it's voice(s) and then add their own chapter on the end. 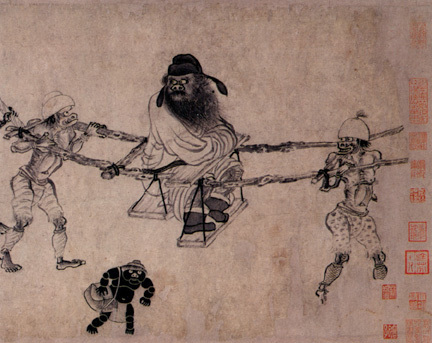 Because this game has been going on for more than 2000 years, scholars have separated it into the Inner Chapters (the oldest part said to be authored by a man named Zhuangzi) and the Outer Chapters (later inspirations). In my opinion the best translation of the Inner Chapters was done by David Hinton . He boldly translates peoples names into English, like Gaptooth and Master Timid Magpie, and so brings out more of the book's natural humor. The best book of commentary on the Zhuangzi is Wandering at Ease in the Zhuangzi , edited by Roger T. Ames. All the essays in here are worth reading. My two favorites are "Just Say No to 'No Self' in the Zhuangzi," by Chris Jochim, and "Knowing in the Zhuangzi: 'From Here, on the Bridge, Over the River Hao.'" In "Just Say No..." Jochim joyfully jostles with the concepts of Self and No Self and whether or not they are in the original text at all. In "From Here..." Ames uses as a jumping off point, an argument between Zhuangzi and his best friend Hui Shi about whether or not a group of fish are happy.